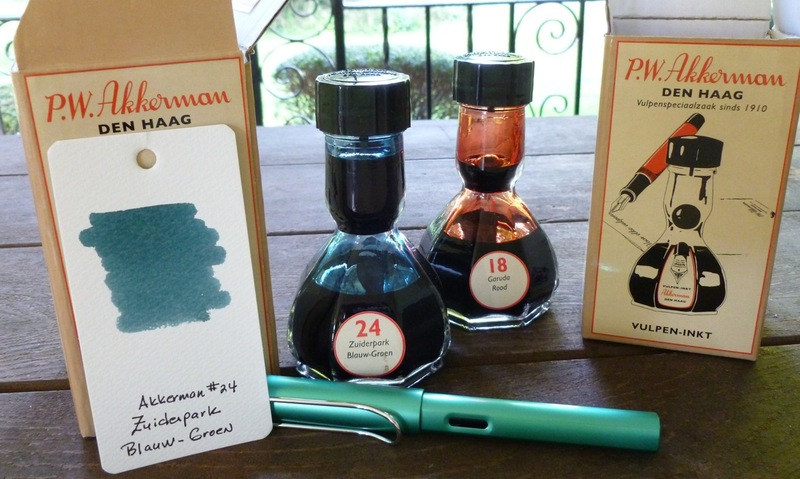 Prior to the DC Pen Show, I took the Vanness Pen Shop up on an offer to order a couple of bottles of Akkerman ink, for pick-up at the show. By pre-selecting, and pre-paying, I wouldn’t have to worry about them running out of the colors I was interested in. This was especially appealing because I was only able to attend the show on Sunday and I figured they’d be picked clean by then. So I ordered Akkerman #18 (Garuda Rood) and #24 (Zuiderpark Blauw-Groen). On Sunday morning, the Vanness Pen Shop booth was my first stop, and since the ink was already paid for, it felt like I was getting it for free! The colors I reserved WERE sold out, so my approach was a sound one. 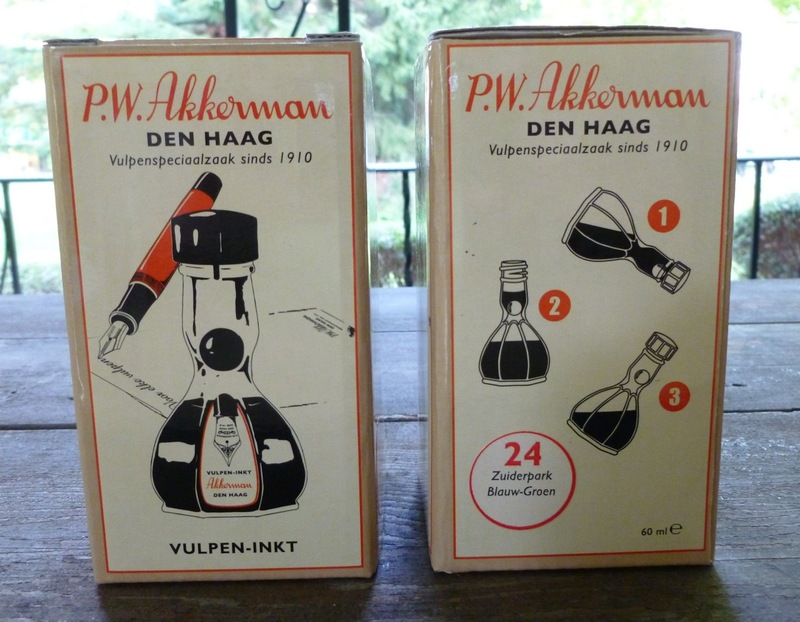 I couldn’t wait to take a look at those cool Akkerman bottles. 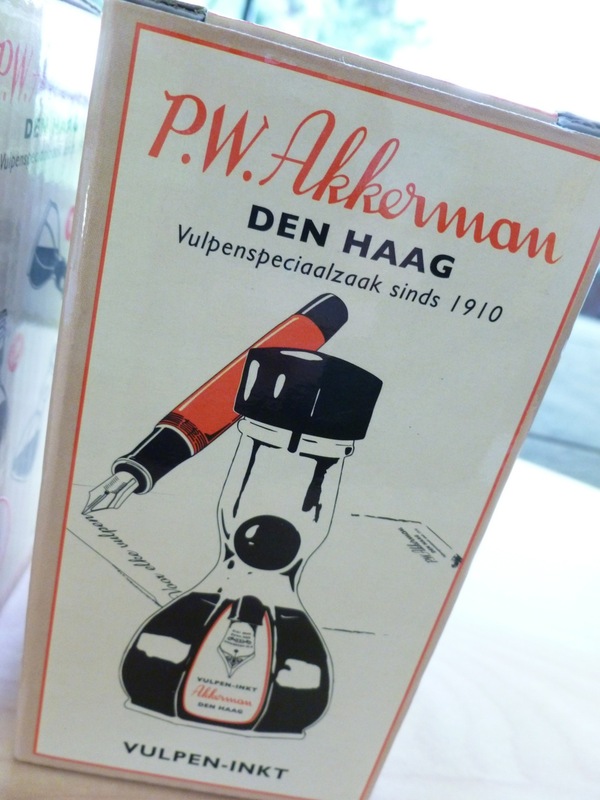 If you’re not familiar with them, Akkerman ink bottles (60 mL, from the Netherlands), feature a wide bottom with the long neck. This neck contains a marble that seals off the opening after the neck is filled with ink. So, to fill your pen, you tip the bottle, the marble slides out of the way and the neck fills with ink. Tipping the bottle back to an upright position causes the marble to drop into place to seal off the neck. Dip your pen into the “trapped” ink to fill it, then partially tip the bottle so that the marble dislodges and the ink flows back into the bottle. It’s a unique and very well thought out system. I’ve wanted Akkerman ink FOREVER. Well, at least since 2012, which feels like forever. And I FINALLY had some. We shopped all morning, took a break for lunch, then shopped and browsed a little more. I wound up with a bunch of bags…the goodie bags handed out upon entry to the show, as well as the bags I accumulated during the show. I was very careful to keep track of my stuff— double and triple checking myself after each stop at a table. I’d freak if I left something behind. But there’s confusion and excitement, sort of a recipe for disaster. At the end of the day, we flopped in our hotel room and I took inventory. All present and accounted for. Exhale. We stayed around a couple more days, headed into Baltimore on Monday to explore the city and visit with Chris and Mark of Write Notepads & Co. (more on that in another post). That evening, we took in a Yankees/Orioles game at Camden Yards. Each time we ventured out of the hotel, I stashed my pens– the ones I’d purchased as well as the ones I’d brought from home— in the in-room safe, just in case. I left all of the other stuff— some Write Notepad Co. notebooks, Montblanc Oyster Grey ink, some free Delta ink samples, and the Akkerman ink in the handle bags in the room. Finally, it was Tuesday morning— time for the 7+ hour trip home— and we had to skedaddle. We had to make it home by 6 pm in order to pick up our four dogs from the vet/boarding so speed was of the essence. We packed up after breakfast, I double-checked the closet and the safe, scanned the room, and hauled everything to the car in one trip. The trip home was miserably rainy, but I love road trips, so it was a fun day. We picked up the boys at 5:30. Perfect. I went through the first handle bag looking for the little brown bag holding my Akkerman boxes. Hmmm. Well, it’s gotta be in this other bag. Nope. Or in THIS bag. Nope. Despair. Disbelief. Confusion. Anger. Blame. I passed through all of the possible stages of missing-ink grief in a matter of minutes. I sprouted an instant headache. I called the hotel, gave them my name and room number and information about the ink (feeling a little bit like a weirdo). I mean, people leave pillows and laptops and stuffed animals, but INK? They took my information but in my mind, I’d already written it off. It’s gone, I kept saying, to myself AND out loud. This is not the type of thing to discover right before bed. The next day I had a call from Virginia. Florida, a manager at the Sheraton Tysons Hotel, called to follow-up and asked for a more complete description of the ink and the bag I had it in. I googled some Akkerman images and sent them to her. I explained that it HAD TO BE in room 1617 in a small brown paper bag with my name on it. She said she’d contact Housekeeping to see if they’d found my ink. Later on, another call from Virginia. My heart jumped! But no, this call was from Elizabeth, the Housekeeping manager, saying that she’d do her best to track it down. People might already be in the room, though, she said, but she’d see what she could do. Then in the afternoon, the call I was sure wouldn’t come came. They’d FOUND MY INK in the room. Florida confirmed my credit card # and said she’d have it shipped out asap. My headache, and nausea, receded. What a great feeling. What great customer service! I raced to my desk and wrote both Florida and Elizabeth thank-you notes. I tweeted thank yous! I gave them all 5’s on the Sheraton survey that arrived via email. I was, you could say, very happy. And relieved. AND puzzled. Where the heck was the ink in the room??? How had we missed it when we scanned the room on our way out??? Well, we’ll never know the answer, but who cares? The ink arrived in excellent condition, and I cherish it even more than I would have had it made the trip home with us. 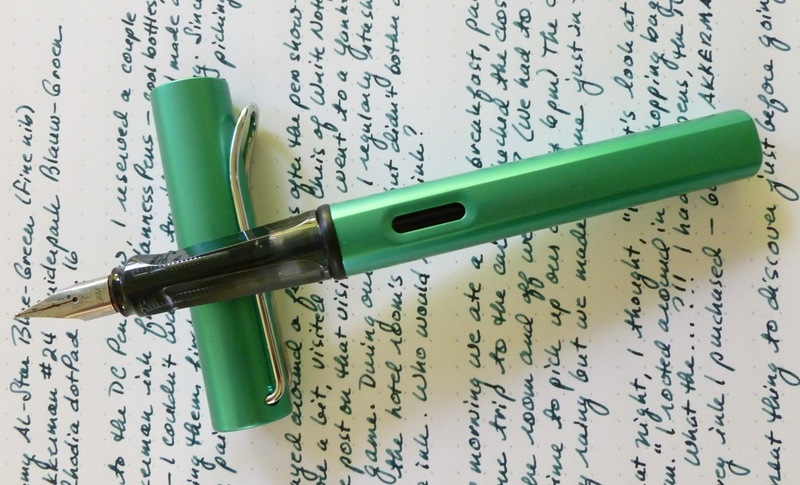 I’ve been using the Akkerman #24, a gorgeous blue-green (Blauw-Groen) in my Lamy AL-Star Blue-Green (fine nib) and they complement each other perfectly. 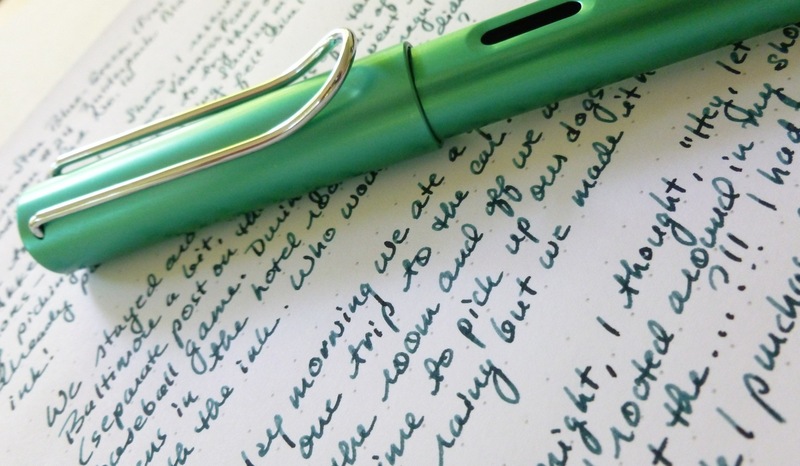 This particular Lamy writes exceptionally well, very smooth. That ink in this pen is a great match. My Akkerman ink took the long way home, but it’s here now, and I love it. I’ll be forever grateful to Florida and Elizabeth at the Sheraton Tysons Hotel for taking a genuine interest in my stupid little debacle and for providing stellar customer service. Even if they hadn’t been able to track down my ink, I would’ve been grateful for their efforts and phone calls. Make a list of your purchases (or really, all of your critical items) and take inventory before you leave the hotel. Consolidate everything into as few bags as possible. Never leave the hotel room in just one trip. Always go back for a second or third look. Don’t let your spouse or partner rush you! 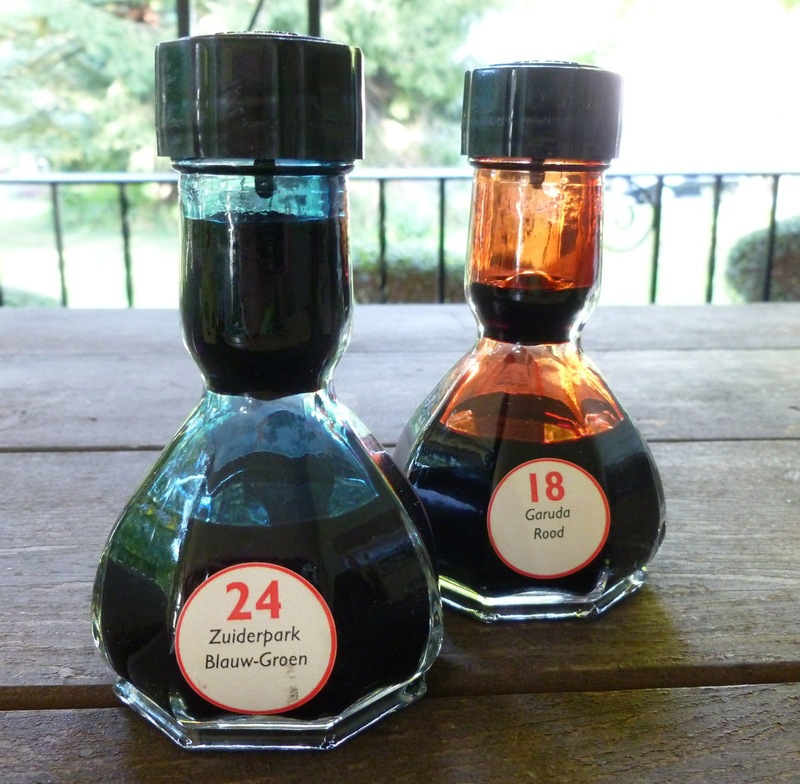 Such cool bottles filled with excellent ink. Smile. You are the best storyteller Mary! So glad you got your ink back – I would have felt the same way. Anger. FEAR. TERROR. NAUSEA. GET IN CAR AND DRIVE BACK. Whew. Happy ending 🙂 And props to the hotel for good customer service! The hotel staff really were amazing. The DC Pen Show certainly picked a great site!! Wow! great story, happy ending. Those are just about the coolest ink bottles I’ve ever seen. “Cue instant nausea”…. you make me smile!